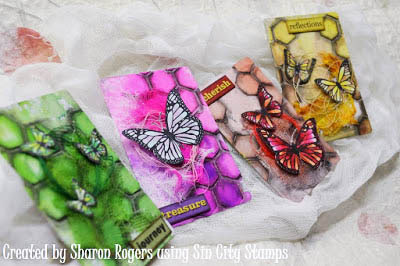 Today is my first post as a new DT member of Sin City Stamps and I am excited to share my Altered Playing Cards with you using butterflies from the stamp set "Dandelion Wishes with Butterflies" available now in the Store! There are just so many stamps on this sheet that I will be sharing more creations with you using this set - endless possibilities - and that's what I like with stamps - multiple uses! 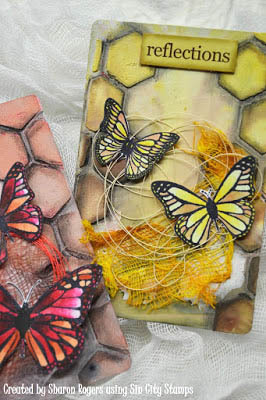 I have step by step details below for you and I hope you are inspired to try some altered cards yourself! Playing cards - any size - old or new! General crafty tools like scissors, spatula, tweezers etc. 1. Okay let's get started by 'assembling" your supplies - LOL if you are like me you might add as you are going along! But to start I grabbed what I needed to get the cards prepped and drying and whilst waiting for them I have the items to stamp and color! 2. Firstly I sanded the cards because the ones I have are very "plastic" (is that a word??) and I wanted to give the Gesso something to grab when applied. I am a bit lazy and hate washing paint brushes so I tend to just use my spatula and smear the Gesso over the card - it doesn't matter if it is not all totally covered - I like the any bits showing through just adds to the texture and overall look. Once they dried I used one of my favorite stencils and some texture paste and randomly applied over the cards. I'm working on 4 cards at once - a good way to get multiple items made at once and you can have a production line going! 3. Once the texture paste is dry it's time to get inky fingers - and luckily I have a "bloke's" job so it doesn't matter if I have stained fingers! I used 2 colors on each card to get a shaded type look with some dark and light spots around the texture. I spritzed the cards with water and then ink sprayed and let it run off. I always grab an index card or scrap of card to drip the excess on to - a great way to have a fun colored background for another creation - waste not want not! 4. Whilst everything dries you can be stamping your images, coloring them and fussy cutting them out. I used markers in coordinating colors and various sized butterflies for each card. You will see that I do a lot of fussy cutting - I have a fear of white space so I spend a lot of time cutting all the excess away on my creations! 5. I wanted more definition and depth on the base cards so I used a charcoal pencil to outline the pattern of the stencil and then a cotton bud to smudge it all out and give the shadow look - I always love this sort of effect and the black looks good on the bright colors. 6. We are nearly finished! Assemble all your "bits & pieces" and start to play with the layout. I ink sprayed the scraps of muslin to match the colors on each card plus wound some matching sewing cotton around my fingers to make the circles of fiber. I had some perfect colored little "words" but you can always make your own on the computer as an alternative. Then glue everything onto the cards! I glued the "body" of the butterflies and raised the wings for more of a 3D effect. And we are done! I love using playing cards as a base to work on - just like an ATC - a little work of art. And what I like about this is you can get quite a few made at once - I'm hoping to join an altered playing card inspirational word swap and we need to make 22 altered cards so this process is a perfect way of getting so many done efficiently! Hope you feel inspired and we would love to see any of your creations shared over at the Facebook Group! My Blog to see more of what I like to do!